First Line: Barchester was not equipped with air-raid sirens, being both beyond the range of German bombers and of no strategic value-- but bomber squadrons could become lost on nights when fog unexpectedly blanketed the south of England, and while the emergence of a cathedral spire from that fog might confirm to the navigator that he was too far off course to return home safely, to the bombardier it would recall the words of the commanding officer: "Some target is better than no target." In many ways, solitary Arthur Prescott considers the Barchester Cathedral library his home, and he's happiest when he's surrounded by its ancient manuscripts. His job as English professor at the University of Barchester holds very little appeal for him. No, he'd rather spend his time in the cathedral library, researching his unfinished guidebook to the medieval building. Then a lively and lovely young American named Bethany Davis arrives with the task of digitizing the library's manuscripts, and Arthur's quiet ordered world is turned upside down. However, he eventually learns that Bethany is a kindred spirit-- and a fellow Grail fanatic. Arthur and Bethany join forces to find the lost Book of Ewolda, an ancient manuscript telling the story of the cathedral's founder. When the future of the cathedral itself is threatened, their crucial search leads them to discover secrets about the cathedral, the Grail, and even about themselves. It didn't take me very long at all to fall head over heels in love with this book, and I believe that any reader who loves excellent characterization and a story filled with ancient books, buildings, and history will, too. If readers also love stories about the quest for the Holy Grail, well, that's just icing on the cake. I qualified on all scores, and I loved The Lost Book of the Grail. First and foremost are the characters. Arthur is as emotionally hidden as the Grail. He has two good friends and his cathedral library, and that seems to be all he wants-- except for the lost book of Ewolda. Bethany is young and pretty and smart, and she blows into Arthur's life like a blast of fresh spring air, but she, too, has her secrets. Watching these two dance around each other is one of the joys of reading the book. There's also some code breaking to do, and although I found that part absorbing, I was drawn time and time again to the characters because Lovett provides vignettes of the panoply of people charged with keeping Barchester Cathedral and its library safe. From the cathedral's founder to bombing during World War II to the present day, there are some wonderful characters to meet. My favorite of them all is probably Margret Barlow, a simple woman of wisdom and common sense who discharged her duties with grace and speed during a time of great danger. Character-driven readers are probably going to love this book every bit as much as I did (and do). If you're worried that the book is going to be buried under King Arthur and his knights along with that Grail, it's not. 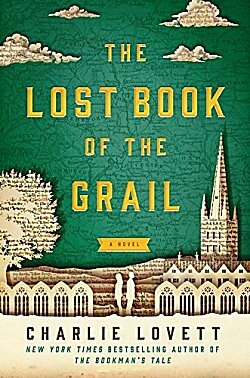 The Lost Book of the Grail is a feast for readers who love characters and books and history-- and who realize how important they are in this world. What a marvelous reading experience! Great review Cathy. Have put a copy on hold with my library on the strength of it. Now I'm going to be all nervy wondering if you'll like it! Oh, this looks fabulous, Cathy. Setting, context, characters, looks like it's all there. Move over, other wishlist items! Hope you enjoy it, Margot! I ordered it from the library today too. When you give an A+ rating, I usually want to read the book. I just realized in the past several years that I like character driven atmospheric books. I had never thought about it before. Speaking of or writing about A+ books, I read the Sea Detective some time ago after your rating. I loved it so much and went on to read the next two books. Mark Douglas-Home is right up there next to Elly Griffith as a favorite author now. I agree. I love his books, and I'm glad I had a little something to do with your reading them.